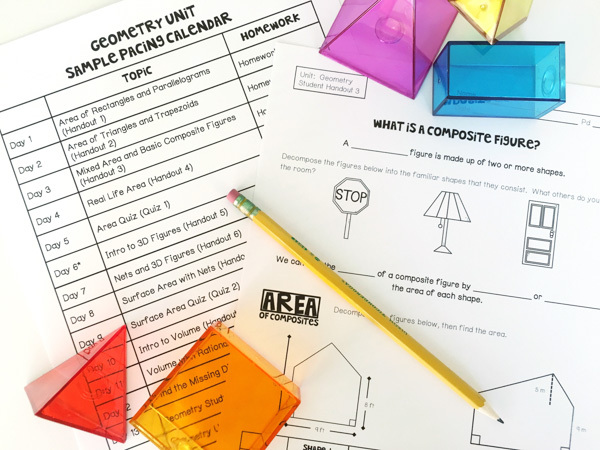 WHAT IS INCLUDED IN A MATH CURRICULUM BUNDLE? Scaffolded notes that allow students to obtain the content in a step by step manner. Each unit is organized to include a day-by-day sample pacing guide with student-friendly notes. You have the flexibility to determine which content standards your students need structured notes and which you would like to supplement with an activity. 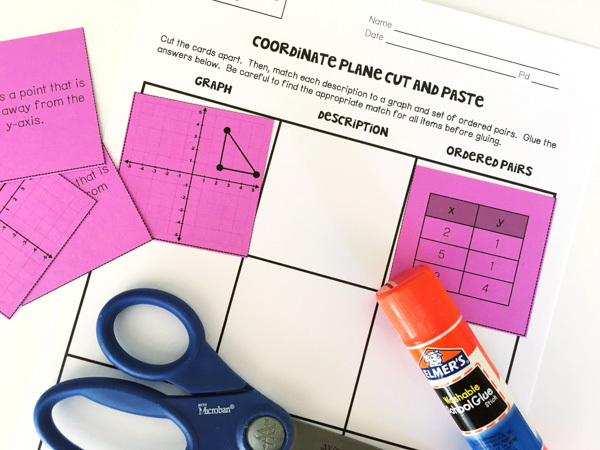 Engaging activities organized for partners, groups, and whole class. Each unit comes with 6-9 aligned activities from solve and colors, to scavenger hunts, to task cards, and interactive flip books. As you plan you are able to determine which skills would be best to utilize an activity. Many teachers use some of the activities as a class or in centers and save the remainder for tutoring, intervention, or test prep. Quizzes and tests are included and aligned directly to the lessons. Study guides grouped with "I can" statements allow students to know exactly what they need help on before the test. In addition, some units include performance tasks, so students can show what they know in a non-traditional way. Future aligned resources are included. You will also receive all future CCSS products that are aligned to the grade level when you purchase the math curriculum endless bundle. Additional activities and updates are added to the file to better meet the needs of your class, making your life easier. Hands down the best purchase I have made in a while! I'm a first year teacher who got thrown into teaching 6th grade math at the last minute. This bundle has been so valuable in planning and teaching all things 6th grade! My district has a pacing guide that we have to follow to a T but there aren't many resources provided to teach from. It is very easy to rearrange the units to fit my pacing guide and I love how everything is right there waiting for me! My kiddos respond really well to the guided notes and my co teacher has mentioned how easy it is to find entrance points for some of our struggling students. The study guides are great as are the quizzes. My district has specific tests that we must use however I have used the 'tests' as pretests and additional study guides if my students want to retake an assessment. Each activity is well thought out, most are just print and go. Planning is a breeze with this bundle, saving me time to figure out everything else that goes with teaching:) If you are debating to purchase this bundle, jump in! Best decision I have made in a long time!! Thank you so much for providing a well thought out, everything included bundle! 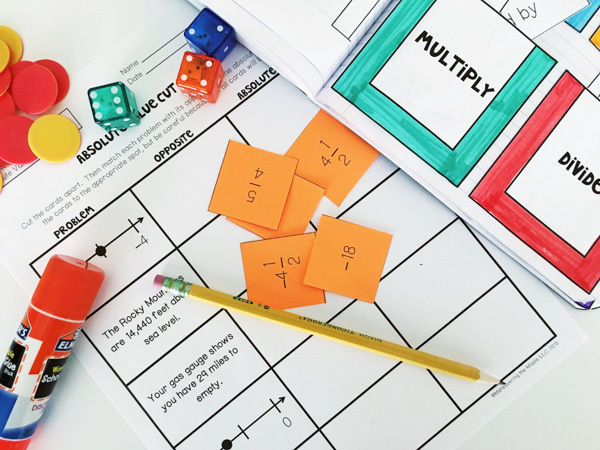 I teach students who are working at least 2-3 years below grade level and this bundle is an excellent resource for the strong visual models and supports they need to make progress in math. While the bundle provides grade-level curriculum, the format gives me excellent access point opportunities to support high-needs differentiation. I appreciate that the author surveyed her TPT followers - it was very thoughtful. I can't speak highly enough of this resource. My only wish for future versions? An easy way to decrease the number of items per page as my students often require more space show their work. Thank you!!!! This was a HUGE financial investment and one I thought about for a long time. I even emailed the seller a few times with questions because I am not one to spend this kind of money essentially sight unseen. That being said. This has been the BEST purchase I have made this year. This bundle has EVERYTHING!!!! I mean EVERYTHING!!! Great resources for instruction, practice, centers and assessments. I am so happy with this purchase. Job well done! Fabulous resource, thank you! I am that teacher who finds multiple things to use for the same standards and then gets overwhelmed with what to use. I then wind up making a folder to stick that in. Not only does this provide you with a pacing guide, but it also includes how to organize the resources and answer keys in a neat binder with covers and spine labels to print. Thank you! I own 6th, 7th, and 8th grade bundles. This was a huge investment, but WORTH every penny. I am new to teaching 6th and 7th grade Math. I was spending all my time with the lesson planning. These have been a life saver. Thank you! I look forward to each new unit you add. 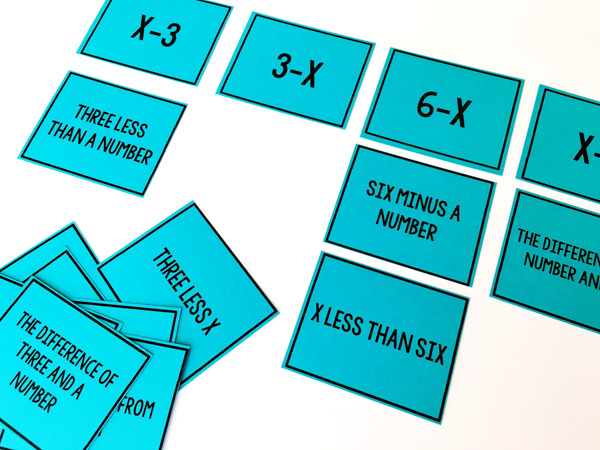 A complete resource for 8th grade math students that is well designed. Includes guided notes for students, homework, assessments, and activities. I also appreciate the amazing customer service I received. I was having trouble on my end, and received a timely return email and my problem was solved within minutes. I highly recommend this seller! Once you purchase, future 6th grade CCSS resources and activities are included. 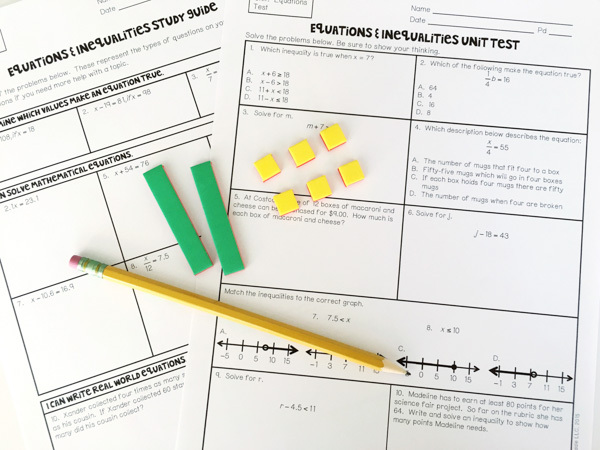 If you would like to find out more about each unit or purchase them individually, click to view grade level units and activity bundles. Once you purchase, future 7th grade CCSS resources and activities are included. Once you purchase, future 8th grade CCSS resources and activities are included. How do you recommend implementing the math curriculum bundle in the classroom? There is a suggested pacing guide. It includes all of the notes, homework, and assessments for the unit. The activities are not included on that, since every district allots a different amount of time for each unit. So, lets say that your students remember how to add decimals well, you might replace the notes day with just an activity for that concept, or skip it all together and move on to the next one. Overall, the bundle provides an excellent framework to pick and choose from, or if you are new to the grade level or without resources, you could start and day one and move forward. Many teachers suggest using some of the activities and saving the others for intervention classes, tutoring time, or standardized test prep! My curriculum pacing is a different order, will the bundle still work for me? Yes, the units are organized in a logical manner, however your district may specify that geometry concepts be taught in the fall. While the unit in and of itself is not editable, you can easily rearrange the order and even adjust the pacing to meet your students needs. My state doesn't allow us to use CCSS on any of our resources, is the bundle a possibility? Some states have moved away from the CCSS, but still have very similar standards. The resources within the bundle only include CCSS within the teacher directions, not on student pages. My entire team is looking to use these resources. Is there pricing to meet our needs? I do offer discounts to teams, campuses, and districts who are interested in implementing Maneuvering the Middle lessons. I have a few campuses around the country who have chosen to do this and have been very pleased with the ease of planning and preparation. Please contact me to inquire about the pricing and more details. THANK YOU FOR YOUR INTEREST IN MATH CURRICULUM BUNDLES BY MANEUVERING THE MIDDLE.